For as long as I can remember the idea that creating great products that people want to buy seemed like an intuitively obvious way for a business to be wildly successful. Along the way, companies also needed to employ people and pay them a wage that would enable them to buy those awesome products. Now a new book by Roger Martin explains how we managed to become the pawns of Wall St hedge fund managers and investment bankers. If our political leaders really want to make a difference that improves our economy and our country as a whole, they will make the changes necessary to enable business to get back to the roots of what they should be doing and ignoring Wall St.
Ok, I've got one extra Amazon Kindle FIRE left, and its too late to return it. So I'm giving it away! Step 2) Publicly SHARE this post. That's it! You're entered to win, and I'll ship it to you ANYWHERE. – One extra entry if you leave a comment telling me WHY you want it. – One extra entry if you Subscribe to our Livid Lobster newsletter! I'll announce the winner on Geek Beat LIVE on Friday Jan 6 (basically in a week), and then here on Google+. Good luck to all! If the US Patent and Trademark Office grants this patent to Apple (and based on past experience, they almost certainly will) then we know the system is irretrievably broken and all software related patents should be utterly disregarded and related court cases should be dismissed. Samsung just doesn't seem to get it do they? 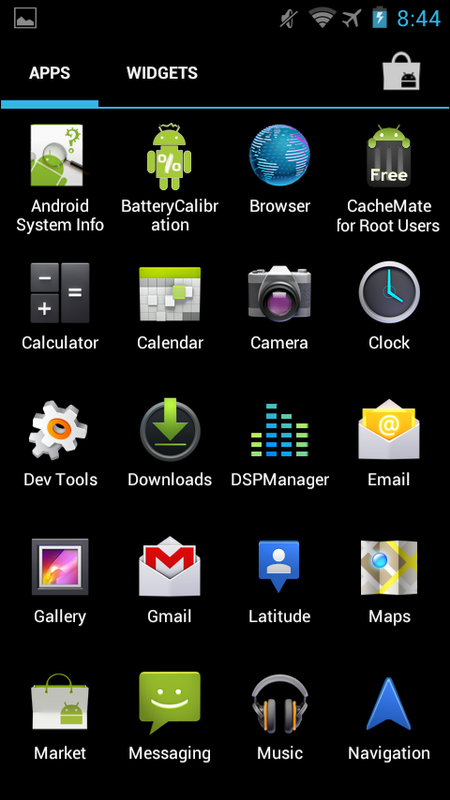 Just provide a vanilla build of Ice Cream Sandwich for all Galaxy S phones that is available as an optional upgrade for anyone that wants it. Don't waste time and resources trying to fit in pieces of Touchwiz or adapting parts of ICS to Gingerbread. Keep it simple and let the Touchwiz fans stick with GB. In this column from April 2009, PC Mag's Sacha Sagan clearly demonstrates why you should be careful what you ask for. At the time a grand total of two Android phones had hit the market, the original G1 and the Magic, both manufactured by HTC. At the time Sagan ruminated on the slow roll out of phones from all the manufacturers that had committed to supporting Google's new OS. Fast forward to today when Android is the most popular phone OS and every tech pundit on the planet seems to pleading with manufacturers like Samsung, HTC and Motorola to slow the launch of only mildly differentiated devices so that they can provide better support for existing devices. Hopefully the pendulum will soon settle down somewhere in between the two extremes with a reasonable but not ridiculous selection of devices and faster OS updates from the builders. I've never seen this video before but it's really cool! My daughter Penelope (7) just asked me to explain the concept of "infinity". The closest I could get to the first step was to show her the amazing and classic "powers of 10" video by charles and Ray Eames… what other mind-blowing classics should we check out to explore the universe? I'm shocked that a paper I once considered amongst the most thoughtful could come out in favor of such a deeply flawed piece of legislation. Looking for something to put on that new Kindle, iPad, Nook, iPod…? May I be so greedy as to suggest…. Public Parts is not yet available on Kobo (until I have a hissy fit). Even though I've been using a Droid 3 since July, I still use OG Droid that I ordered on day one more than two years ago as a streaming media player. Since early this year, the old Droid has been running on various Gingerbread builds from either +Peter Alfonso or Cyanogenmod. After the success I had loading an early Ice Cream Sandwich ROM onto my son's Samsung Fascinate last week, I decided to try it on the OG Droid. 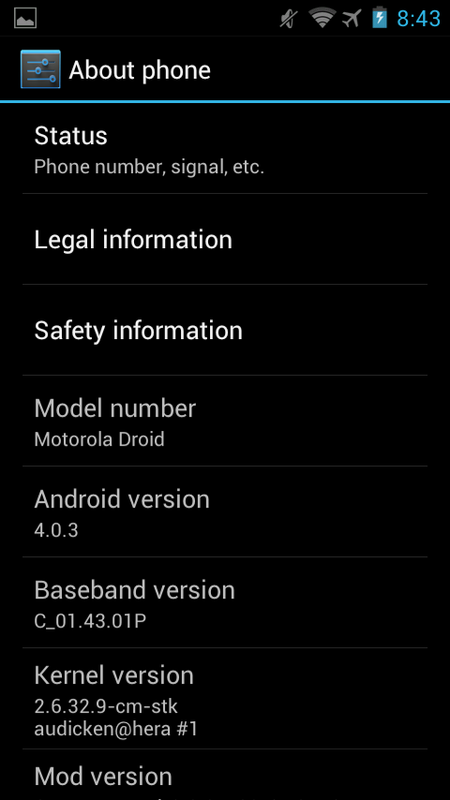 I found an early build based on Android 4.0.3 on the XDA-Developers forum and installed it last night. It's far from complete but it is remarkably functional for what I currently use the device for. The phone apparently works although I wouldn't know for sure since the OG isn't activated at the moment. The WiFi works and apps like stitcher, pandora, google music and reader are all functional. GPS doesn't work right now so no maps. Skype does work for voice calls so the phone could be used over WiFi. 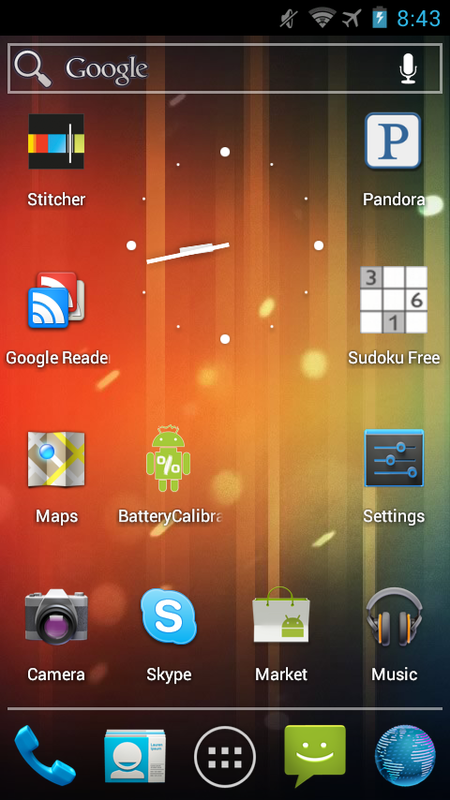 I'll keep playing with it and flashing updated builds, but so far I really like what I see of ICS. Unlike crazed Apple design nerds like John Gruber, I actually really like the way the new Roboto screen font looks on the phone. I also like the new browser, the GMail app and the new UI as a whole. I can't wait until an ICS ROM is available for the Droid 3. For now though a vanilla ICS build works remarkably smoothly even on this old phone with just 256 MB of ram and rom proving again that Samsung's excuses for not updating the Galaxy S phones is cop out. Update: You can find the rom files in this forum, http://forum.xda-developers.com/showthread.php?t=1393632 Go through the thread for updated versions.